During the late evening of 2 February 2007, the owner and four crew of the Max Fun 35 yacht Hooligan V sailed from Plymouth towards Southampton following out of season repairs and maintenance. At about 0320 UTC on 3 February, the boat’s keel became detached and the boat suddenly capsized causing the loss of life of one crew member. The skipper/owner, two experienced watch leaders and two new crew arrived at Hooligan V’s berth at about 1630 on 2 February. The boat was checked out and the two new crew members were briefed on the safety gear, equipment and sailing procedures. At 2335 the boat passed Plymouth breakwater. There was an 8 -10 knot north-easterly wind, and the mainsail and genoa were rigged. Just before midnight the first reef was put in the mainsail. The boat was on a port tack, heeling about 15º to starboard and making about 7-8 knots over the ground. Soon afterwards, one of the watch leaders and one of the crew went to their bunks. The owner followed at 0045, after putting the second reef in the mainsail. By 0245 the wind had increased to 25 knots, gusting 35 knots, and the boat was heeling 25º to starboard. At 0300 the relief crew arrived on deck. At 0315 the heel increased to 30º and preparations were made to put the third reef in the mainsail, the genoa having already been 2/3 furled. Before the mainsail could be reefed, the list rapidly increased, and at about 0320 the boat very quickly inverted, trapping the skipper inside the cabin. Once in the water, three of the crew found their way to the transom and immediately noticed that the keel was missing. As they set about cutting the liferaft lashings, the skipper managed to push the flare box and grab bag out of the cabin. These floated to the surface and the flares were set off. At the third attempt, the skipper escaped from the cabin, but there was no sign of the fourth crew member. Fortunately the crew managed to free the liferaft and set off more flares. The crew were finally rescued at 0430 by a nearby ship. The body of the missing crew member was recovered by Salcombe lifeboat at 0655. 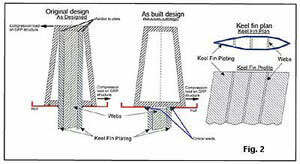 Investigations found that the fabricated steel keel had failed just below the fillet weld connecting the fin to the taper box (Figure 1). Laboratory metallurgical analysis confirmed that the keel had suffered fatigue failure in the fillet weld area, which had been subjected to high bending stresses. Defects were also found in the keel taper box welds, and two of the three keel bolts had also failed. It was further discovered that the builder had sub-contracted the hollow keel construction to a steel fabricator who had no marine experience. The fabricator changed the original design, and incorporated a fillet weld in a critical area, to ease manufacture and reduce costs, but without the supporting calculations to assess the stresses to which the keel would be subjected (Figure 2). He did not consult on the changes with the designer. Although the designer was made aware of the keel changes by the boat builder, he did not validate them. In 2005 the owner contracted a UK yacht designer to optimise the yacht for IRM and IRC racing purposes. This involved adding 160kg of lead to the keel bulb. Detached keel Hooligan VOnce again, there were no supporting calculations, nor were checks made against the “original” or “as built” design drawings to ensure that the modification would not adversely affect the design to cope with the “in service” loads. Analysis of the “original” design calculations confirmed that they did not achieve the required Safety Factor of 2. The “as built” keel safety calculations were worse, and these were exacerbated by the addition of the extra bulb weight. The fabricated keel was unable to withstand the “in service” bending stresses and this led to the conditions of failure. When the boat was taken out of the water at the end of the 2006 racing season, considerable detachment of the keel’s epoxy filler and anti-fouling was found. There was also evidence of possible fine cracking in the steel adjacent to the fillet weld, but this went undetected and so the last chance to prevent the accident was missed. Despite a statement by the designer that the Max Fun 35 was built to ABS standards for yacht design, the minimum Safety Factor of 2 was not achieved. The reason for this is that he used the keel steel ultimate tensile strength instead of yield strength in his calculations. The Recreational Craft Sectoral Group urges those in the marine industry to use the ISO standards listed in its Guidelines to avoid confusion and adopt a common approach. It is not possible to state whether a keel built to the designer’s specification would have failed because it was the fabricator’s design that was fitted to all of the Class. However, the designer, having been made aware of changes, should have checked that they were appropriate and did not compromise safety. The addition of bulb weight was not supported by calculations, and neither was reference made to the design drawings. Where possible, drawings should be consulted and suitability of the changes discussed with the designer/builder. None of the yachts inspected had the required EU marking showing RCD compliance. No builder’s plates were fitted and there were no Declarations of RCD Conformity. The repairer was not sufficiently experienced to appreciate why the keel filler and coating detachment occurred. He occupied himself with removing the corrosion products and priming the bare keel metal rather than finding the reason for the detachment which was probably due to keel flexing. Fabricated steel keels are vulnerable to bending stresses. Where there is doubt, repairers should seek advice on the suitability of using Non-Destructive Examination techniques to determine the keel condition. Alternatively, a copy of the report will be sent on request, free of charge.